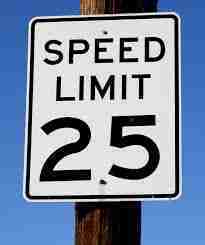 Whenever the government makes a change to a law or a speed limit for “our safety” I am always leery of the decision. Call me a cynic if you will. I just don’t have faith in nanny state leaders. I’m not saying that nanny state officials are intellectually impaired, but they haven’t had the best track record when it comes to decision-making. Case in point is this story from Jalopnik out of Brooklyn http://jalopnik.com/how-one-street-shows-what-goes-wrong-when-we-mess-with-1707534253#. The nanniest of nanny states, New York City, pushed for a citywide 25 mph speed limit to make the streets safer for pedestrians. Typical of most this-is-in-the best-interest-of-the-people-but-lacking-real-world-sense government decisions the idea is great, not so much in execution. The reduced speed limit in Brooklyn is having typical unforeseen negative circumstances. The Brooklyn area mentioned in the article is a stretch of highway called Ocean Parkway that was designed to move large amounts of traffic safely and swiftly. So, in order to save the masses, the speed limit was reduced. Now traffic congestion is higher than it was before and so what are drivers doing? Leaving Ocean Parkway, which was designed to move traffic along—safely—for narrow, often residential, side streets, where presumably children play. Does this have disaster written all over it or is it just me? It gets better. The city politicians, who lobbied so hard for the safety of New York’s eight million plus residents, now want the speed limit put back. And the Department of Transportation said, “No, it’s fine.” This is what happens in the nanny state folks. The saddest thing about this is that more than likely fatalities will rise, and the age of fatalities might drop. Let’s recap. New York lowered the speed limit to save lives and in doing so have created traffic congestion, which causes spill over, which puts vehicles on residential streets where children play. All brought to you by your local government which makes decisions for your safety with little to no foresight of the decision’s consequences. But what do you think? Should the speed limit stay the same or be raised? This is like those State Farm commercials come to life. The lesson here is let animals have the road, I guess. I abstained from Ram jokes. You’re welcome.